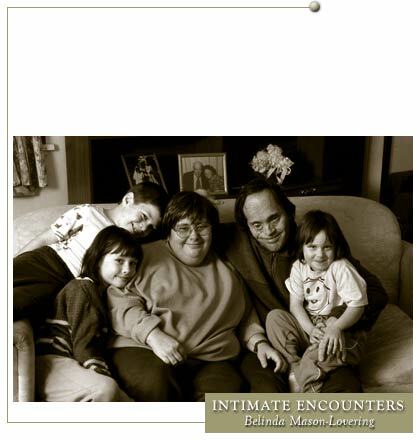 The idea for Intimate ENCOUNTERS first came to Belinda Mason-Lovering in 1998. While photographing a conference on Sexuality and Disability, she became aware that “Although society attends to the needs of people with disabilities, it appeared unable to deal with the tangled issues surrounding sexuality.” This realization was to pave the way for the development of Intimate ENCOUNTERS. Over the next four years, Mason-Lovering traveled around Australia, meeting, photographing and engaging her subjects in extensive conversations to explore their feelings and attitudes towards their own sexuality. She worked with each participant to develop an image which reflected their own particular personal and emotional journey. Choosing how they were represented, working in close collaboration with the photographer and taking control of their image and the text that would accompany it, was seen as a widely liberating experience for the participants. That these photographs vary from playful, romantic, passionate or heart wrenching reflects the diversity of experiences of disability, and within that the diversity of lives and desires, an acknowledgement that disability is just one part of a life experience. Initmate ENCOUNTERS challenges the hidden (and often, at times, not so hidden) myth in our society that only the most glamorous, attractive and successful among us lead active, healthy and imaginative sexual lives. It is a myth intonated through images present at every edge of our consciousness. Screened, flashed, flickered and fleshed out through film, print, press, art and internet – eventually projected from person to person, generation to generation. But then there is the truth. We all have our own, unique sexual journey, mapped out with secret adventure, whispered aspirations, with the pain of risk and the over riding urge for intimacy. It is a journey that, if fully embraced, determines and moulds our identity and self-worth. Ultimately, it’s about how we feel about our inner selves that let’s us free each other to lead larger lives. 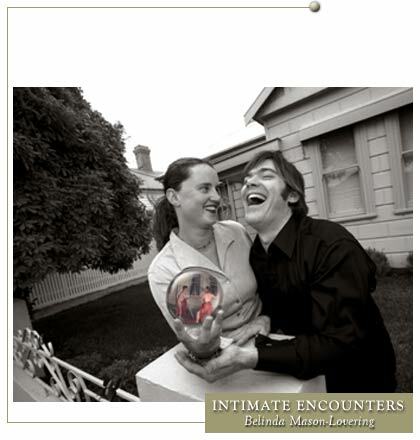 Intimate ENCOUNTERS has been touring Australia extensively for the past six years. It has been shown in London, New York, Barcelona and Paris. As Kiersten Fishburn, of Accessible Arts points out, “For we viewers, it is not only a beautiful and thought provoking exhibition but a chance to identify the commonalities of the need for love, for connectedness, for sexual and creative expression. It creates a dialogue that allows disability “voices” to be heard; it is one step in integrating these voices into all our cultural and community conversations. Taken from articles and press releases by Belinda Mason-Lovering.